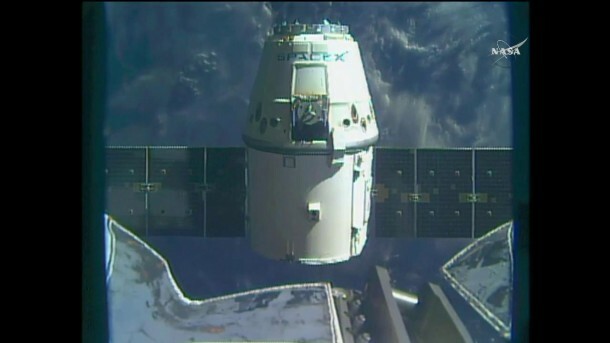 Expedition 50 astronauts Thomas Pesquet of ESA (European Space Agency) and Shane Kimbrough of NASA released the SpaceX Dragon cargo spacecraft from the International Space Station‘s robotic arm at 5:11 a.m. EDT. With the spacecraft a safe distance from the station, SpaceX flight controllers in Hawthorne, California, will command its deorbit burn around 10 a.m. The capsule will splash down at about 10:54 a.m. in the Pacific Ocean, where recovery forces will retrieve the capsule and its more than 5,400 pounds of cargo. The cargo includes science samples from human and animal research, external payloads, biology and biotechnology studies, physical science investigations and education activities. The SpaceX Dragon spacecraft was released from space station at 5:11 a.m. ET on March 19 after delivering more than 5,500 pounds of cargo. Dragon, the only space station resupply spacecraft able to return to Earth intact, launched Feb. 19 on a SpaceX Falcon 9 rocket from historic Launch Complex 39A at NASA’s Kennedy Space Center in Florida, and arrived at the station Feb. 23 for the company’s 10th NASA-contracted commercial resupply mission.